Cajun BBQ Shrimp is one of the many unique and ubiquitous foods for which New Orleans is known. The Crescent City has many famous dishes — Jambalaya, Shrimp Creole, Étouffée, Gumbo, as just a few examples. Seafood really shines here. Crawfish, oysters, and of course, shrimp, play leading roles in Cajun cuisine. 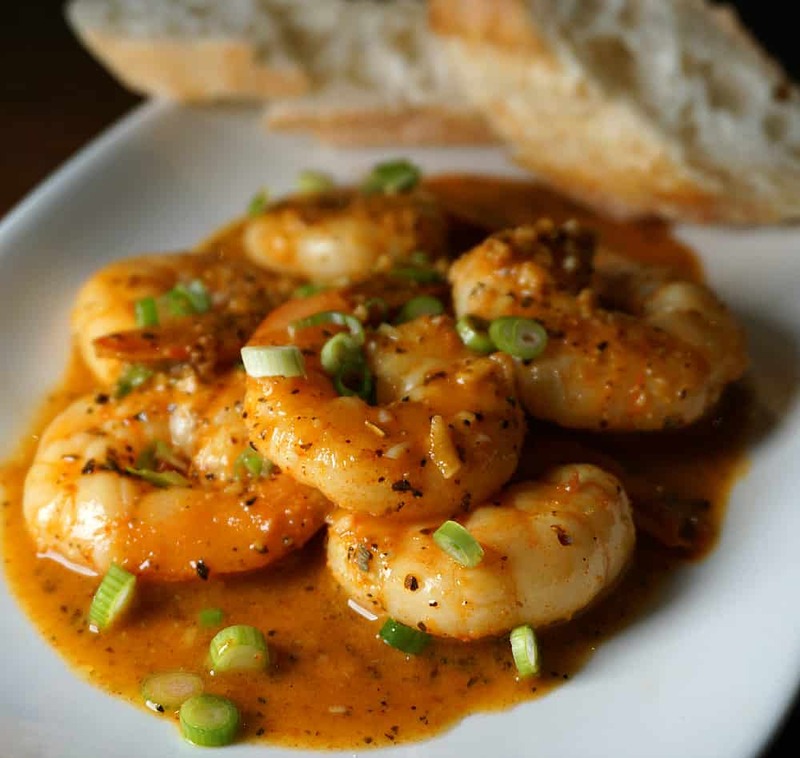 This barbecued shrimp recipe was created to elevate the flavor of the beautiful, fresh gulf shrimp, giving it just the right amount of Cajun spice. And of course, it has plenty of butter in it, so it’s a true Southern dish. 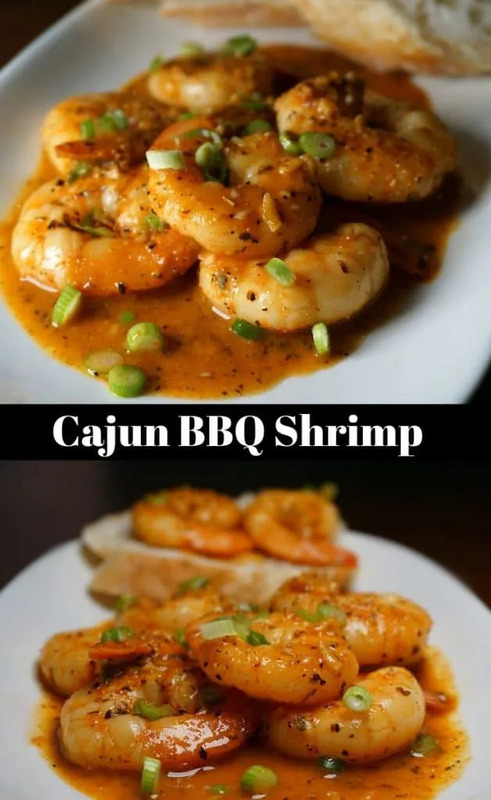 Why are we calling this Cajun BBQ Shrimp instead of Creole BBQ Shrimp? What’s the difference between Creole and Cajun? The simplest explanation is that Creoles were migrants who settled in urban areas, whereas Cajuns settled into more rural areas, particularly in the Southwest. While there are similarities, each group has their own unique cuisine, dialects and traditions. Echoes from their French, Spanish, African and American Indian forefathers can be seen and felt in both cultures and cuisines. The blending of all of that heritage has some delicious results that renders the cuisine from the region as deservedly world-famous. There are some distinct differences in the cuisine. Cajun recipes almost never have tomatoes, while Creole heavily relies on their use. Since this recipe doesn’t involve tomatoes, it falls squarely in the category of Cajun cuisine. But, for the spice mix, Creole spice mixes and Cajun spice mixes are interchangeable. We’ve included our Cajun spice mix recipe, but have a caveat. We typically use store-bought seasoning purely out of convenience. Our absolute favorite is Joe’s Stuff, which we buy every time we pass through New Orleans. 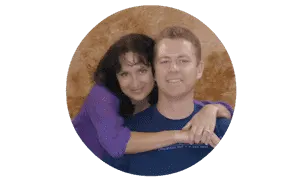 You can easily get it online as well. One of the benefits of Joe’s mix is that it’s much lower in salt than is typical. That said, salt is still listed as the number one ingredient. The benefit in making your own mix is the ability to control the sodium content. If you choose to use a commercially available mix, taste it first and adjust the amount accordingly. This dish can easily get too salty if using the wrong prepared Cajun spice mix blend. Traditionally, the Cajun BBQ shrimp are cooked whole, unshelled with the heads intact. I think this actually enhances the flavor of the dish, but it has one drawback. It makes things pretty messy to eat. Depending on your dinner guests, you may want to peel and devein the shrimp, as we did in this recipe. Or, get messy and be prepared with lots of napkins! Despite the name of the dish, there is no barbecue involved in its preparation. 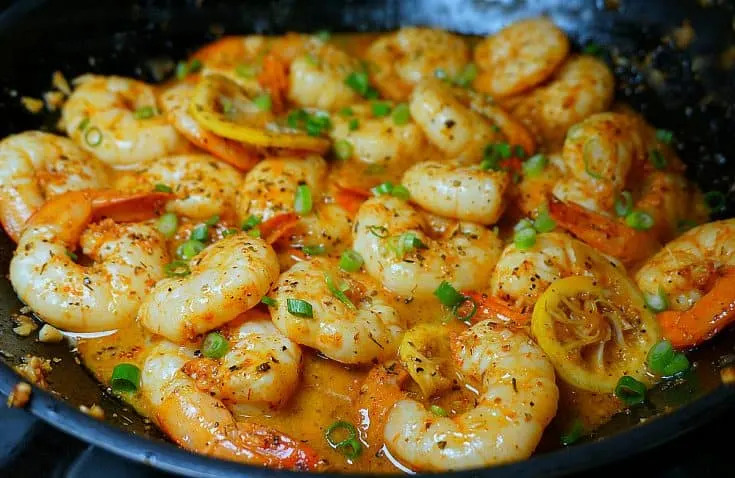 These shrimp are cooked in a pan on the stove. It’s actually a pretty quick and simple (and delicious) thing to prepare. Go ahead and give it a try! 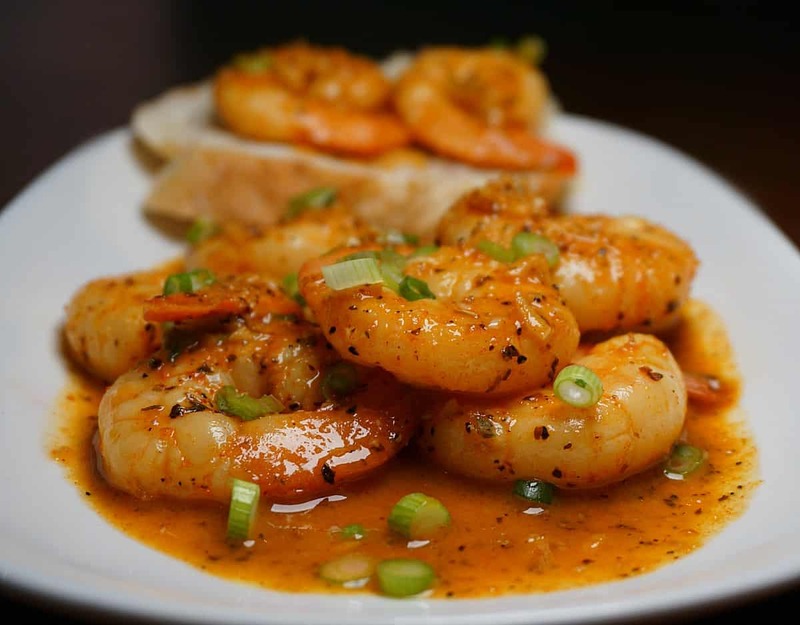 Serve the shrimp with a fresh sliced French baguette to sop up all of the sauce along with some extra hot sauce (such as Crystal Louisiana Hot Sauce, which will bring the heat but not overwhelm the dish with too much vinegar). 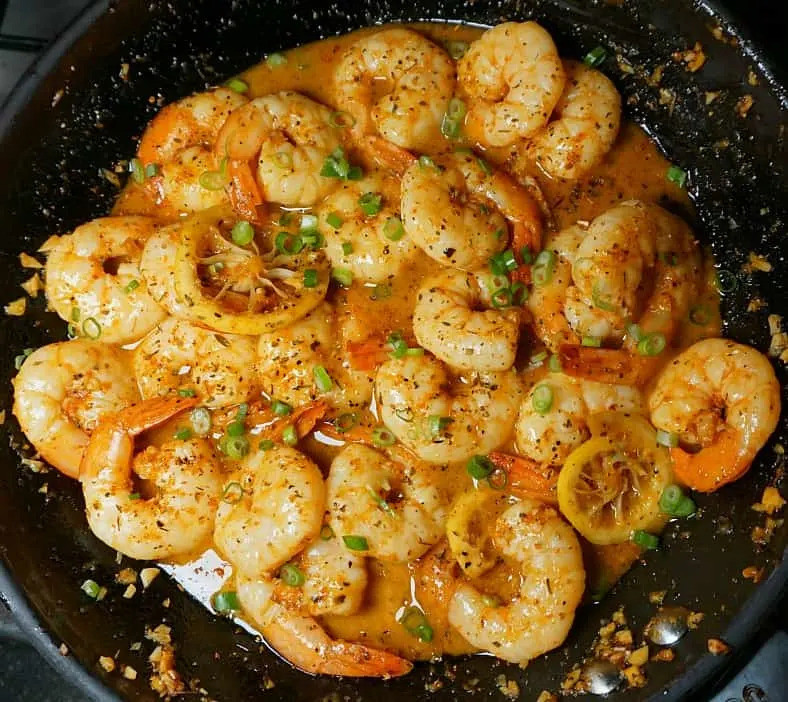 This Cajun BBQ Shrimp recipes combine fresh gulf shrimp with cajun flavors and lots of spicy deliciousness. Don't forget the French bread to mop up the sauce. Cut lemon in half. Squeeze out the juice of one half for the recipe, and cut the remainder into thin rounds. In a large skillet combine oil, Worcestershire sauce, lemon juice, sliced lemon, cayenne pepper, Creole seasoning, and garlic. Cook over moderately high heat for one minute. Add sherry (if used) and shrimp, and cook until shrimp turn pink, about 1-2 minute on each side. Reduce heat to moderate and stir in butter, a few cubes at a time, stirring constantly and adding more only when butter is melted. Plate the shrimp with sauce. Garnish with green onions. Delicious cajun spice mix, perfect for any creole or cajun recipe.